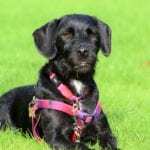 How Can Tellington TTouch Help My Dog? 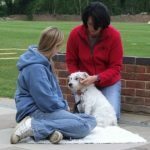 Using TTouch Bodywork and Groundwork on a regular basis can help your dog to become a more calm and confident canine, building a deeper relationship with your dog based on co-operation, trust and understanding. Observing your dog on a daily basis will help you notice any subtle changes that might occur both physically and mentally. 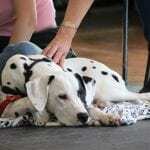 Postural changes can happen when tension is carried throughout your dog’s body. This can be as a result of a medical problem, injury, change of circumstance or emotional upheaval etc. 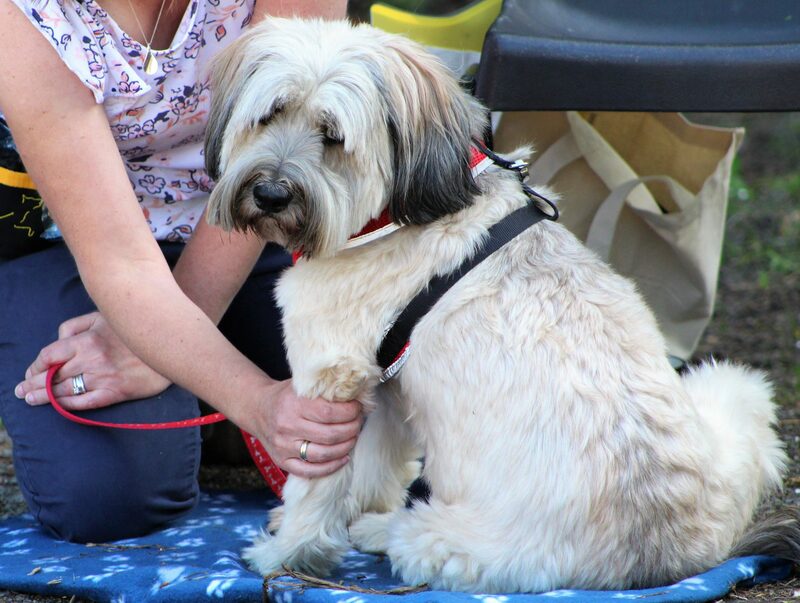 So what can you do to help your dog feel more comfortable and confident and help them cope in situations that they may find stressful? You can start to gather information as to where your dog may be carrying tension throughout his body by making a flat hand assessment. Instead of just stroking your dog, mindfully move your hands over his body and watch for any reaction that he may express. These can be very subtle from looking at the area that you are touching to placing his nose on your hand. He may sit or lie down on the area that you have just stroked in order to stop the contact or he might start to play or fool around as a distraction to avoid contact. If this doesn’t work he may become very still (freeze) and his eyes become hard and staring. This is a definite sign to stop what you are doing as his next move might be to snap at you. Other signs are more obvious – curling a lip or growling. This is an escalation of their behaviour which can occur if we ignore the more subtle signs that they express. Using the back of your hand for this process is less threatening for your dog and enables you to feel any changes in temperature. Coat changes such as the hair standing up or looking dull, dry and scurfy or a change in colour can be caused by a lack of circulation and tension. Check how easy it is for your dog to pick his feet up by lifting each leg slowly. If the foot feels rooted to the ground he may be carrying tension in his shoulders or hindquarters. You can also check the wear on his pads and nails of his feet as this will show you where he puts the most pressure. Using your hands to make specific gentle movements of the skin on your dog’s body will stimulate the nervous system into responding in a positive way. It will help to release tension and improve circulation, reducing levels of stress and helping him to relax. Some simple ear work, making long gentle strokes from the base of the ear to the tip can help to lower heart and respiration rates. I found this particularly useful at the vets where my dog, Wilbur, becomes a quivering wreck. 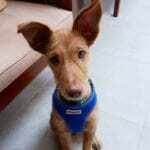 Being able to calmly work his ears lowered his stress levels and stopped him from shaking. This has also been useful for both my dogs as they are worried by fireworks. Together with ear work a body wrap (stretchy elastic bandage), put on around their body so that it is just in contact, gives them a sense of security helping them to settle. 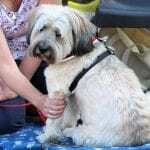 Sarah (owner, Pet Necessities Training & Behaviour) also found this helpful with a previous dog, Billy. He had become blind and was becoming distressed at night and would pace when Sarah went to bed. He was also concerned about being left and suffered an increase in anxiety due to his loss of sight. I showed Sarah some bodywork which she did with him in the evening which helped him to relax. Sarah used an Equafleece T-Shirt (instead of the body wrap as this can be left on when you are not there), which made a big difference to Billy; he would wear this whenever he had to be left. Groundwork has many benefits for our dogs and for ourselves. 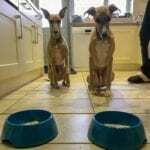 It can teach us to really observe our dogs and see how their posture affects how they think and feel, allowing us to pick up on the small subtle changes that can lead to reactive behaviour. 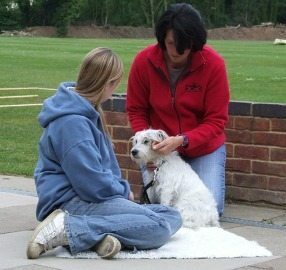 Groundwork will also teach us the subtle ways that we can influence our dogs as well as patience and understanding. Dogs take information in through sight, smell, hearing and touch. If a dog is carrying tension in his body it will inhibit his ability to learn and take on new information and can heighten or decrease his senses (e.g., sight, smell and hearing). This can cause him to react to situations rather than make a calm and considered choice. Our posture and how we react can also influence our dogs and so learning how to change ourselves and release tension that we may be holding and transmitting down the lead will be really beneficial. The groundwork side of TTouch is useful for helping to build confidence and improve focus. Taking our dogs over a series of low level obstacles, poles and different surfaces will give them different experiences and can show them and you their potential to be successful rather than their limits. Asking your dog to move in a slow measured way, rather than rushing, teaches them to be better balanced with more body awareness as well as improving coordination and athletic ability. 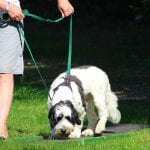 Having a dog that pulls on the collar and lead can be very frustrating for both the dog and you. It will also set up areas of tension in the neck, shoulders and hindquarters. With the use of bodywraps (stretchy elastic bandages), we can improve proprioception (awareness of where his limbs are and coordination), and also give a feeling of security, helping to calm and settle your dog. 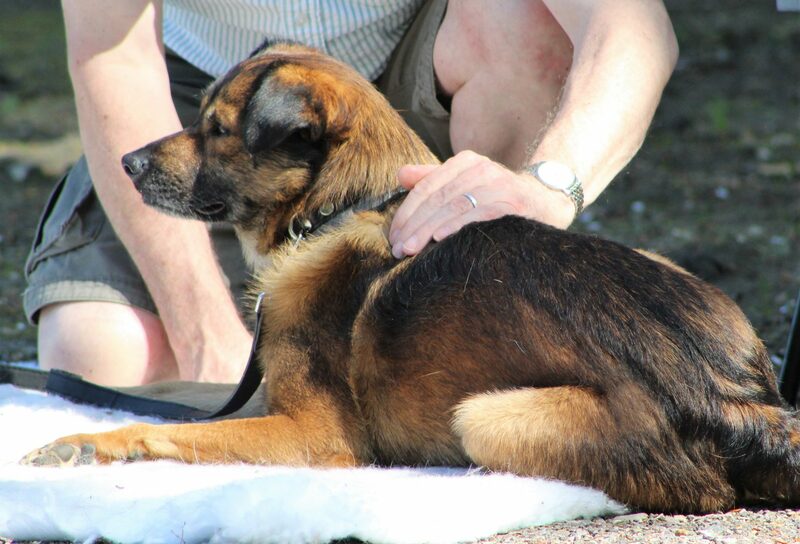 The bodywrap can also be part of the process in introducing your dog to wearing a harness. Wearing a harness can be more beneficial for dogs that pull on the collar and lead as it takes the pressure off of the dogs neck. 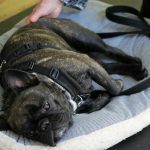 Using two points of contact on the harness makes it easier to help your dog be in better balance and stops any damage that may be done to their neck with constant pulling. Moving them slowly through the groundwork on the harness and two points of contact will engage their brain and start to help them focus. 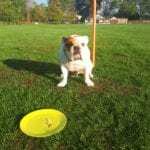 It will improve paw/eye coordination (great for dogs that do agility), as they are asked to move mindfully over and through the obstacles. Doing some groundwork will encourage flexibility and suppleness which will help put less strain and wear and tear on your dog’s joints. 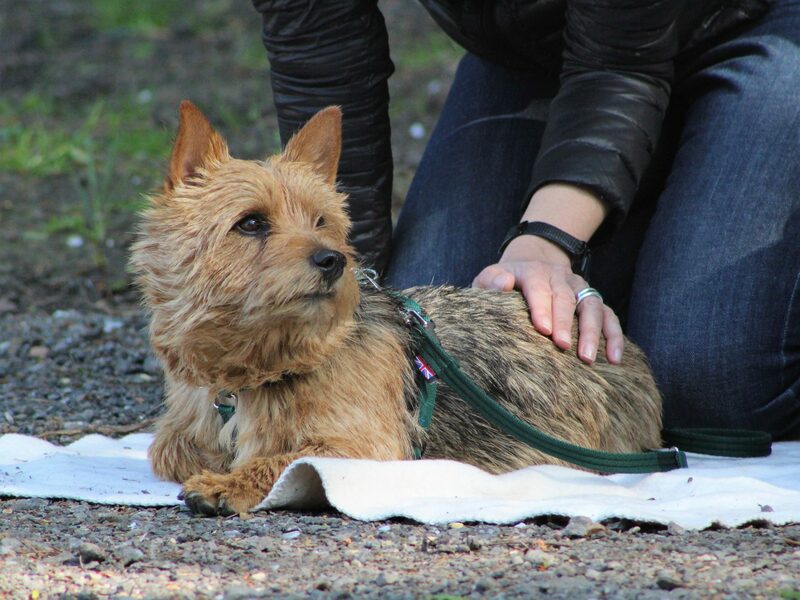 Groundwork can be a safe way to introduce dogs to situations that they find stressful. 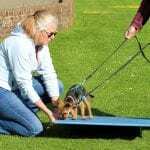 If they are worried by other dogs or indeed people, these can then be introduced during groundwork in a controlled and stress free way so building the dog’s confidence and ability to cope with these situations. 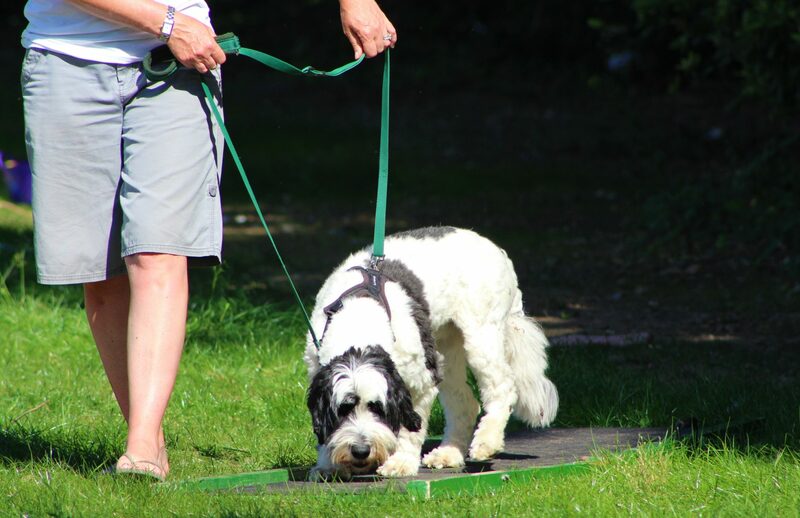 Ten minutes of groundwork can be much more beneficial for dogs that are on limited exercise as it is mentally stimulating and won’t tire them out physically. 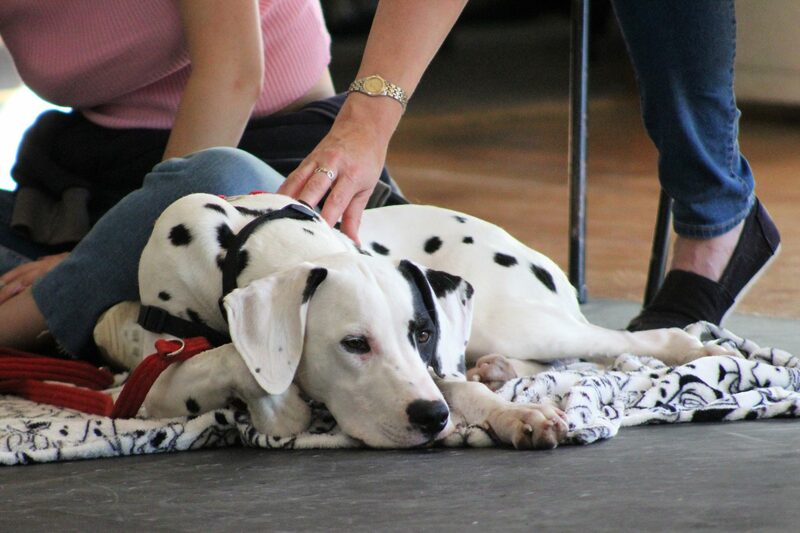 Sessions can be kept short and the introduction of some bodywork (TTouches), whilst doing the groundwork will help your dog to relax and release any tension that they may be carrying. My previous dog Trevor was attacked whilst we were out walking. He was very distressed and very sore from being pulled around by the other dogs. I used specific TTouches (bodywork) to help with any bruising that had occurred and to help reduce his stress levels. He didn’t want to go out for walks as he was very concerned about meeting other dogs. To help build his confidence I set up some groundwork for him. This proved really beneficial and within a few days he was happily going for walks again and interacting with other dogs. 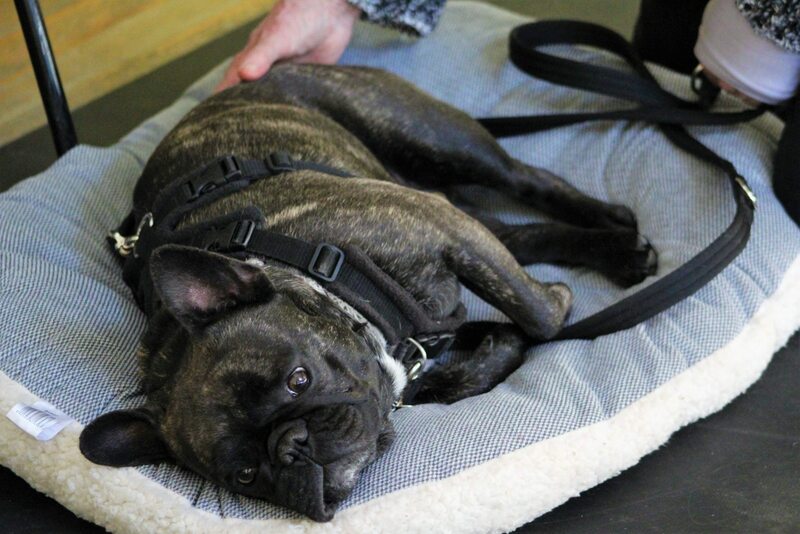 Together with the Bodywork you can help to release tension and show your dog how to change their posture and to move in a more functional and balanced way. This will help to alleviate stress on joints as well as giving them a sense of well-being physically, mentally and emotionally. 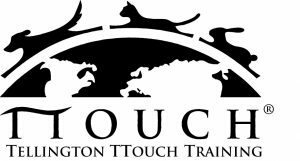 For further information on our Tellington TTouch Workshops, please click here. For the date of our next TTouch Workshop, please click here. Never shout at, hit, yank, push or pull your dog. Training must be fun! If you are not enjoying it then neither is your dog … he should see it as a game. Make sure you always have your dog’s attention before you ask for any command. If he is not looking at you then there is a high chance that he is not listening to you. 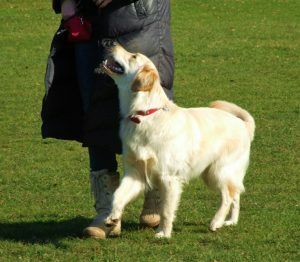 Vary the commands you are practising, never expect your dog to repeat the same exercise more than a few times in a row. Use toys as well as food rewards in your training. 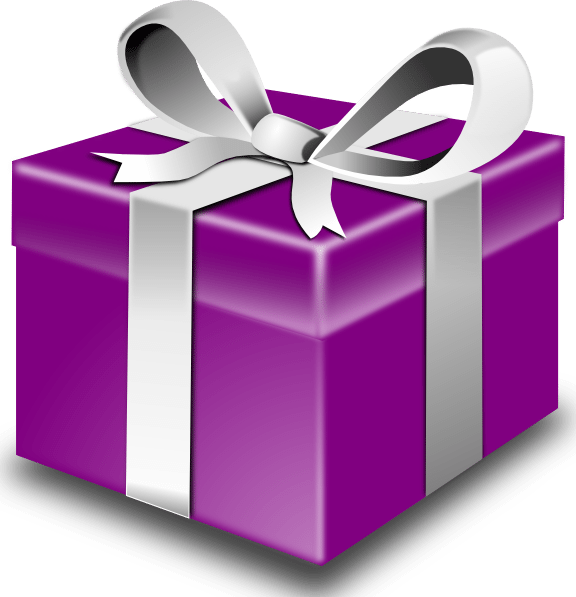 Vary the toys, types of treats and the delivery of the reward during a training session … keep him guessing! Remember that once your dog has learnt a behaviour there is no need to reward every time; instead save your rewards for his best attempts. Grade your rewards so he gets the high-value titbits for putting in extra effort. Practise your training out on a walk. You cannot expect your dog to perform perfectly in a public situation if you only practise in the security of your back garden. Also appreciate that dogs learn by situational learning, so your dog may see “sit” indoors as a completely different behaviour to “sit” in the park. If you are not in the mood to train, don’t train! Your dog will pick up on your negative mood and won’t respond as you hope, causing a vicious circle and resulting in a frustrating training session. Always end each training session on a positive note and before your dog gets tired and de-motivated. Lower your expectations in environments with lots of distractions. Remember that any attention your dog receives from you is reward; so, what you may see as a scolding, your dog may see as a game! Try to ignore unwanted behaviours and only give your dog attention when he is offering a behaviour you like. Make sure your dog is receiving an adequate amount of mental and physical stimulation. Mental stimulation involves your dog using his brain, e.g. using food dispensing toys, playing, training, searching for food etc … the list is endless. Practise, practise, practise! 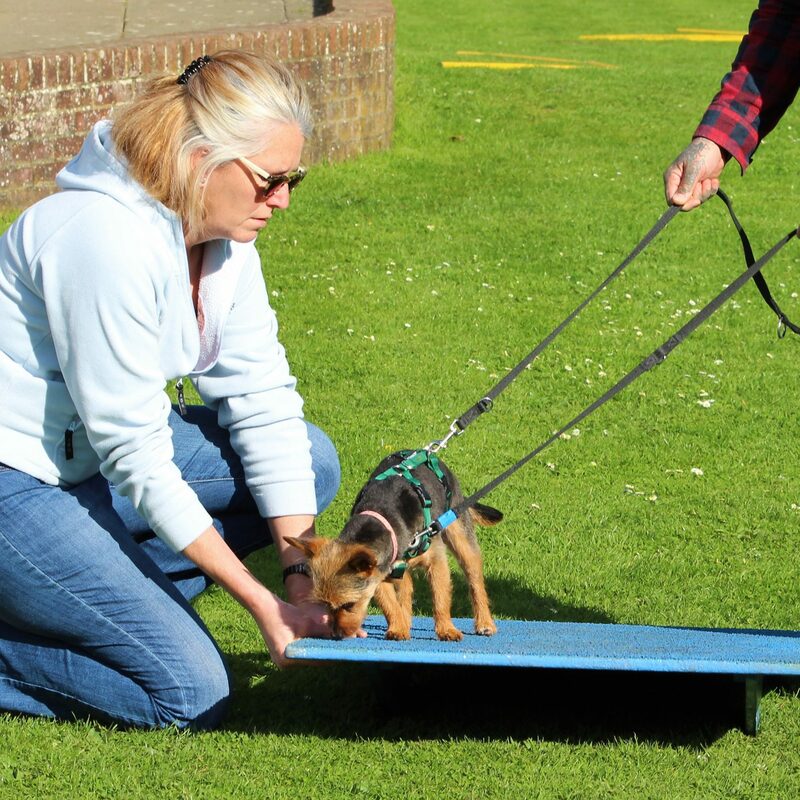 You cannot expect your dog to learn a behaviour after just a few repetitions, you must carry out a small amount of training each day for the rest of your dog’s life to keep the behaviours fluent. Teaching a dog to give you eye contact on command has many benefits. 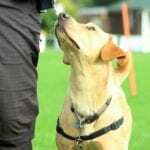 It can be used to keep a distracted dog focussed, maintain attention or build confidence. Some people prefer to use the word “look”, rather than the “watch” command. Many dogs, especially those who are young and exuberant, are easily distracted out on walks. 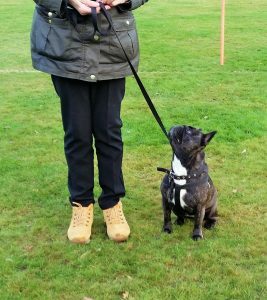 Owners can find it hard to gain their dog’s attention in certain situations, whether that be around other dogs or people, wildlife, joggers, cyclists, etc. This often makes it hard to recall dogs in such situations or keep them focussed on walking nicely on a loose lead. 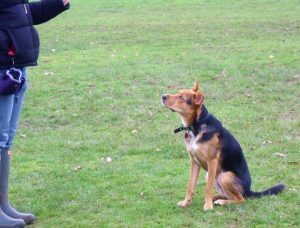 Teaching a “watch” command will enable you to keep your dog focussed on you. This will improve his responsiveness to training, and encourage calm behaviour around certain stimuli. Having a reliable “watch” command is also very useful for dogs that may be reactive in certain situations, or nervous around certain stimuli such as other dogs or people. Teaching a “watch” command to such dogs will enable them to keep their attention on you and therefore be less worried about the environment around them. By providing your dog with this alternative behaviour it will reduce his stress response and build his confidence. This is the most effective way to reduce unwanted barking on a walk, for example. It’s important to start by teaching this behaviour in a location where there are few distractions and your dog feels secure, such as inside your home. Start by showing your dog a tasty treat, then hold this treat up to your eyes. As your dog looks up at you, cue the behaviour with the command word “watch”, and after a few seconds reward your dog with the treat. All the while your dog is making eye contact with you, you can praise and gently encourage the behaviour before giving him his treat. In time, you can start increasing the length of time your dog is maintaining eye contact with you before earning his reward. It is important to reward your dog for keeping eye contact before he looks away, so he is learning to hold your gaze in anticipation of the treat. If you find your dog looks away or gets distracted, you will need to shorten the length of time you are expecting him to maintain eye contact, and reward him more frequently. Once your dog has learnt the behaviour inside the home, you can start to practise in other environments, such as out on walks where the level of distraction may be higher. Sometimes dogs find it harder to remain focused if they are too over excited or uncomfortable in certain situations. If this is the case, you may need to move to a quieter area until your dog is calm enough to focus on you. You can also consider increasing the value of your food reward or taking your dog out before a meal. In difficult situations, you may only be expecting your dog to look at you for a split second to earn his reward. 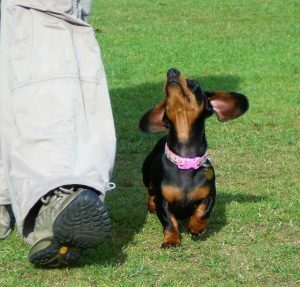 Your dog does not have to be in a certain position to learn the “watch” command; some dogs may find it easier to practise the “watch” from a sit position, others may find it easier to keep focussed while on the move, whilst walking to “heel” for example. It’s a good idea to practise this exercise from many different positions as you will often need your dog to keep moving whilst watching you to get yourselves out of difficult situations. 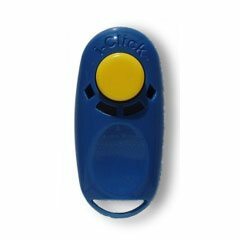 Dogs who have been clicker trained often pick up this command very quickly using the clicker to mark the behaviour. 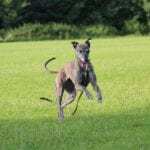 Using the method of ‘free-shaping’, you can allow your dog to work out for himself what you would like him to do. This often results in a much stronger behaviour, and a dog who chooses to offer eye contact much more readily. 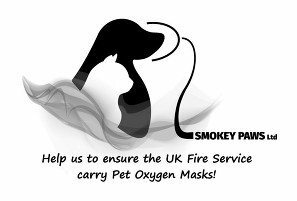 Again, this will need to be started in a very quiet location at a time your dog is likely to be responsive. Starting with your dog in front of you, hold treats in one hand and clicker in the other (these may have to be behind your back if that’s all your dog will look at). Patiently wait for your dog to look up at your face; as soon as he does, immediately click and reward him. After he has done this a few times, you can start to add the verbal cue, i.e. as he looks up you, say “watch”, praise the behaviour, click and reward. You can then start to increase the length of time he maintains eye contact, before clicking and rewarding him. Once he has understood what to do, you can start by cueing him to “watch” before he looks up at you, so he is making eye contact upon the command word. If your dog is struggling to work out what to do for himself, you can give him a helping hand. Using the same principle as above, hold a treat up to your eye and give your dog the verbal cue “watch” as he looks up at you. After a few seconds, click and reward your dog. Remember that the clicker marks the point of correct behaviour. It tells the dog exactly when he has done the right thing and a reward is about to follow. Don’t be tempted to use the clicker as a means to get your dog’s attention; doing this will de-value the clicker and your dog will become less responsive to it. If your dog is not responding to the “watch” command then he is a situation where his arousal levels are too high to learn. Please make the situation easier for him and try again. 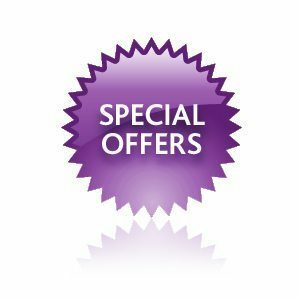 If you feel you require professional assistance with your dog’s behaviour then we can assist you via an individual training session or behaviour consultation, depending on the complexity of the issue.